While not necessarily bigger on the inside, this Doctor Who adult coloring book filled with 96 pages of original designs will make it feel like you've been transported to a whole new world. Planets, galaxies, villains, heroes, the Doctor, the TARDIS and the time vortex - all intricately illustrated in this adult coloring book packed with original Doctor Who art. 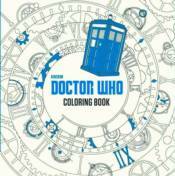 With stunning pages to color plus all the best quotes from the beloved TV show, this out-of-this-world adult coloring book is perfect for any creative Doctor Who fan.